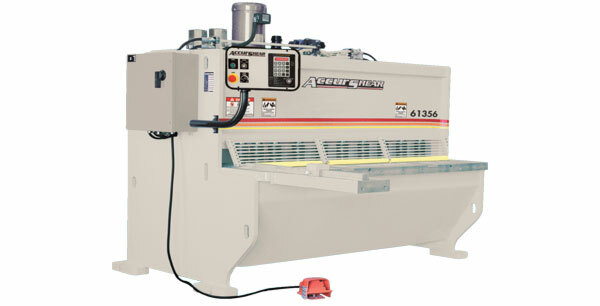 The Accurpress Accurshear 6135 SERIES hydraulic shear comes standard with a shear capacity of up to 80,000 tensile and 44,000 yield strength (a feature standard on all Accurshears). Pendant control c/w on/off buttons, mode selector switch and stroke control dial. 36″ backgauge travel with automatic swing up backstop at full extension. 4-edged blades, top, and bottom, modified high carbon, high chrome. 4′ squaring arm c/w steel rule with 1/16″ and 1mm increments. Drilled and tapped holes in front of table. 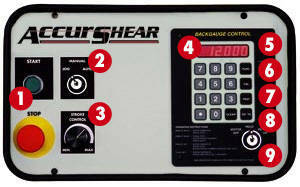 The shear operator may also choose the backgauge retract feature via the key switch. This retracts the stop bar once the holddowns clamp the material just prior to the shear cycle to avoid material wedging between the shear knives and stop bar.